“We’ve got 72 hours in San Francisco”, I said to Sam as we finalised our West Coast road trip itinerary. “That’ll be plenty of time to see everything, I’m sure”, I enthusiastically confirmed as I finalised our hotel booking. Oh how wrong I was. I’ll admit that I underestimated San Francisco - I assumed that three days would be more than enough time to tick off the big sights, eat loads of yummy food and still have some time leftover to mooch around and take in the general vibe. But in truth, the city by the bay is much bigger than I’d anticipated, and with public transport being a little bit trickier than we’ve been used to in other major cities, it wasn’t quite as simple as hopping from one tourist attraction to another. That being said, we still managed to squeeze loads into our 72 hours in San Francisco, and today I thought I’d share our highlights with you. This little guide includes our “must see” activities, our favourite food spots, and a hotel that is perfect if you’ve only got a few days in the city - enjoy! We chose to stay at Hotel Zeppelin after seeing it recommended on a couple of other blogs, and I’m so glad we did. It’s just a block away from Union Square which is the main transport hub in the city, and we found that a lot of the key spots we wanted to visit were within walking distance. On top of that, Hotel Zeppelin happens to be really bloody cool! The interiors are bright and gorgeous, the bed was the biggest one we stayed in on our two week trip and there was even a cool hangout space in the basement. If you’re looking for something that merges city break chic with the edgy personality of San Francisco, this is the hotel for you. If you’re going to San Francisco then my number one tip is to book your tickets to Alcatraz as soon as you book your flights! The tickets sell out weeks in advance, and this is an attraction you really don’t want to miss. I can’t stress enough how impossible it is to get tickets on the day and I promise you’ll be kicking yourself if you rock up without them. My second top tip would be to then make sure you take the audio tour when you arrive at Alcatraz. I would never normally opt to use an audio guide in museums or galleries, but this one is brilliantly done - it’s almost like listening to a crime podcast as you wander around the creepy cells. It was such an interesting and immersive experience and we both raved about it for days afterwards. This is one of the best tourist attractions I’ve ever been to - trust me, even if you’re not that sure you want to go, just book the tickets and thank me later. 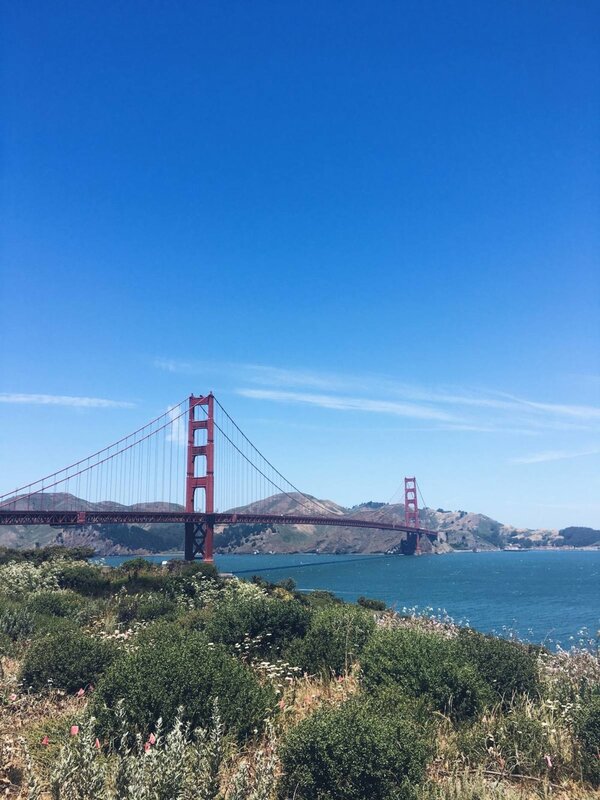 High on our list of “must dos” in San Francisco was cycling across the Golden Gate Bridge. It’s been a bucket list item of mine for years, and it really did live up to the hype. I had the biggest grin on my face as I pedalled across the bridge with the wind in my hair and the sun on my face, and the views back across the city were totally worth navigating all the tourists for! There are tonnes of places to hire bikes in the city, and most are pretty reasonably priced. I’d thoroughly recommend cycling across the bridge and spending the afternoon in Sausalito before catching the ferry back to the city. The weather is much warmer over there (I have no idea why! ), and we had such a lovely couple of hours eating lunch in the sun and taking in the gorgeous view over the water. How many cities can you visit around the world and tick off hanging out with sea lions while you’re there? Not many I’m sure, but in San Francisco you can! Get yourself down to PIER 39 and join the hordes of other tourists watching the sea lions play fight on the floats to the west of the pier - it’s very cute and also pretty entertaining. There’s plenty of other stuff to do in this area too, from playing funfair games to eating some of the best seafood in the city. Plus, you get a great view over to Alcatraz too. One of the most iconic ways to get around in San Francisco is by riding a cable car. They’re a really fun way to get around, offer some great views of the city, and best of all, will help you get up those famous hills without too much effort. I’d recommend heading to Hyde St & Beach St station, which is about a 15 minute walk from PIER 39, and jumping on the Powell-Hyde line. If you ride this for a couple of stops you’ll arrive at Lombard Street, which is a road famous for it’s 8 tight hairpin turns. If you have time it’s worth getting off the cable car for a closer look - there’s also a pretty great view of the city from up here. Now going to watch a baseball game is something you can do in most major US cities, but what makes it unique in San Francisco is the view. The AT&T park backs on to the water and the sun happens to set right behind the stadium, making an already fun event even more special. Haight-Ashbury is the area of San Francisco famed for being the birthplace of the hippie movement. We loved this area of the city and would totally recommend a visit - it’s teeming with gorgeous coloured houses and vintage shops bursting to the seams with bargains. I’d read about Mr Holme’s Bakehouse on a couple of other blogs and worried that it was somewhere that relied on Instagram hype rather than really great food. I’m happy to confirm that I was absolutely wrong - their cruffin is one of the most delicious things I’ve ever eaten in my whole entire life. We had one of the best brunches of our trip at Brenda’s French Soul Food. I opted for the pancakes which were perfectly fluffy, and Sam had fried chicken benedict. Yep, you read that right - fried chicken benedict. Be warned - the portions are HUGE so go hungry. If you do hire bikes and cycle across to Sausalito, I would thoroughly recommend grabbing one of the outdoor tables at Scoma's for lunch. They specialise in seafood washed down with brilliant bottles of wine, and honestly, sitting there with Sam in the sunshine and looking out across the water was one of the highlights of our whole holiday. You can’t go all the way to San Francisco and not pay a visit to this famous bakery. Sure, it’ll be full of tourists, and sure you’ll have to queue half an hour to get your lunch, but it’s worth it. Boudin specialise in delicious seafood chowders, soups and chillis all served up in a hollowed out sourdough bread bowl - heaven! We found Kin Khao completely by accident - we were looking for a decent restaurant within a 10 minute walk of our hotel, and after seeing this recommended on a number of blogs, we decided to give it a go. Kin Khao is a Thai restaurant located within the Parc 55 hotel and has been recently awarded a Michelin star. The food was fresh, delicious, and best of all, great value for money! Despite all of the accolades and excellent reviews, this was the cheapest meal we had in the city. Phew, that post ended up being longer than I first thought! I really hope some of these recommendations are useful and help you figure out how best to spend 72 hours in San Francisco. It’s such a beautiful city with so much to offer. Let me know if you visit any of these places, or if you’ve been to them before - nothing makes me happier than chatting about travel!